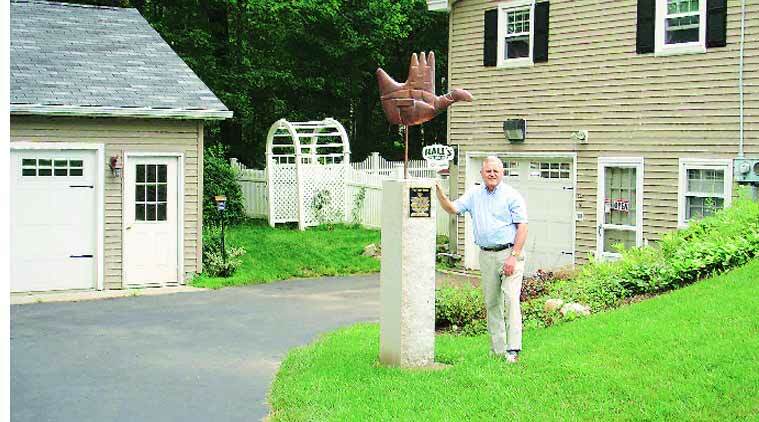 Last month, he even erected a memorial to its creator Le Corbusier by installing a replica of the Open Hand monument on his front lawn in New Hampshire on the US East Coast. Peter Hall with the replica of Le Corbusier’s monument. The city Beautiful leaves visitors impressed in many ways. But one man from the United States has been fascinated with the city without ever visiting it. Peter Hall told Chandigarh Newsline over the phone from the US that his interest in Chandigarh was kindled by his classmate in Boston, Arun Bahl, a resident of this city, and a former Chemistry professor. The 69-year-old Hall, a retired English teacher, said he had then read up everything on Le Corbusier, including The Open Hand: Essays on Le Corbusier, a 1977 collection of articles edited by Russell Walden. “The more I read about Chandigarh, the more I was engrossed by it and finally I fulfilled my wish to have my own Open Hand last month,” said Hall. Hall spent $4,500 and put in a lot of labour to make the replica. He was not able to find any source for a scaled down replica which he could buy. So he decided to write to the Fondation Le Corbusier in Paris that granted him permission to make his own scaled reproduction, providing him two archived drawings of the Open Hand which, he said, were invaluable. Along with his industrial designer son, who had studied Le Corbusier’s work as a student, he ventured into the project with the help of two copper sculptors in the area who specialised in weathervanes. Hall said that he chose copper over the original brass as it was easily available. Since New Hampshire is known as the Granite State, a local quarry was chosen to produce the granite pillar, he added. “This monument, which I will have the pleasure of seeing daily, will serve as an enduring reminder of the ideals of a legendary architect; of the capital of Chandigarh, India, and its people,” he said. On the people’s reaction to this monument there, he said since he worked from home, all the people who visit him are fascinated by it. “One recent young man exclaimed, ‘That’s awesome’. Another person had his five-year-old granddaughter with him. I asked her what she saw besides a hand. She told me she noticed the bird,” he said. He has put up a small plaque under it with his own message. And he is hoping that the uniqueness of the monument will give it a role in the upcoming US elections. New Hampshire is among the first states to hold the primaries. They are to be held in February 2016. “Everyone who is running for US President is now campaigning in New Hampshire. It will be interesting if candidates or their supporters come by to read the final paragraph on this Open Hand’s plaque. It reads that the elected leadership should implement the ideals represented in this work of art for the benefit of all mankind. Income inequality has direct relevance to the Open Hand,” he said. Hall said he and his wife want to visit Chandigarh at least once in their lifetime. Dr Bahl said it was a matter of pride that people across the world reflect and seek inspiration from the city’s architectural heritage.